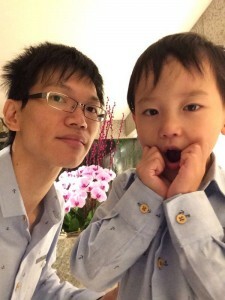 Darren How and his son Pangzi. Darren How can’t wait for his kid to grow up. He’s everything that a dream dad should be. He tires out the little one at playgrounds so that he can sleep early at night and leave him alone. To prepare for bad weather, he gets him the full range of toys and gadgets to shut him up at home. Occasionally, he tries NOT to take him to fast food joints. Needless to say, his kid doesn’t really mind. His attitude to education is very straightforward. Children learn while playing. If they don’t play, they don’t learn. The more they play, the more they learn. You stop them from playing and they stop learning. Most importantly, children learn best when their parents are not around. With this in mind, Darren How tries not to interfere with the natural learning process by making himself scarce, especially during weekend nights when the game is on. He is not opposed to personal coaching, but his son can only ask him questions related to Liverpool. These days, he’s finding it extremely challenging to entertain the little one while the mum is busy elsewhere. He doesn’t understand where kids get their boundless energy from. Nevermind, there’s always the option of vodka. And that’s not for himself. An experienced communications professional and avid writer, Darren How is currently working on a book loosely based on social media monitoring. He’s also the author of “Angry Blog” published on iBooks.